Do you currently use Payroll software? Payroll is essential business software, which makes it all the more important that the software companies get it right. Payroll systems are often the first software a new business purchases, the most often used piece of software, and one of the most complicated. The payroll process requires minute calculations from time cards and careful attention to the state, local, and federal laws. Businesses hoping to reduce the manual labor associated with payroll have driven growth in automated features, meaning that the more advanced payroll systems not only save businesses time every pay period but decrease the chances of expensive payroll law violations. The increased automation in payroll system software has driven a change within the human resources overall. HR professionals and accountants no longer spend half their working hours on payroll tasks. 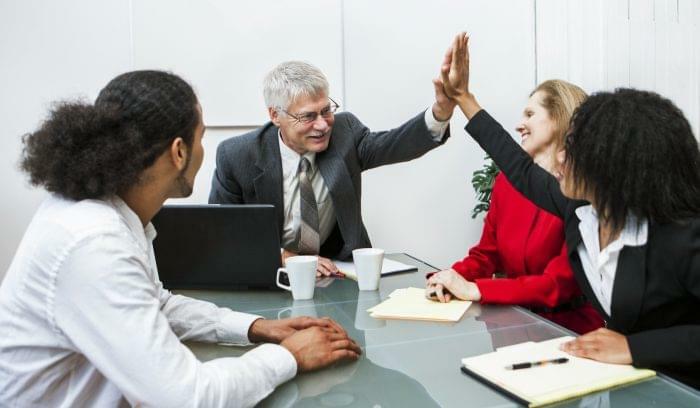 They can now pivot toward financial and people tasks that will make a difference in the financial future of the company, like leadership training, investments, or building company culture. Over the past decade, cloud technology has transformed the payroll software space. Companies and individuals no longer spend time on the most time-consuming payroll tasks like time cards, printing checks, or combing through time cards for individual changes over the time period. Instead, payroll professionals ensure that direct deposits send correctly, watch for exception and edge cases, and manage automated processes. 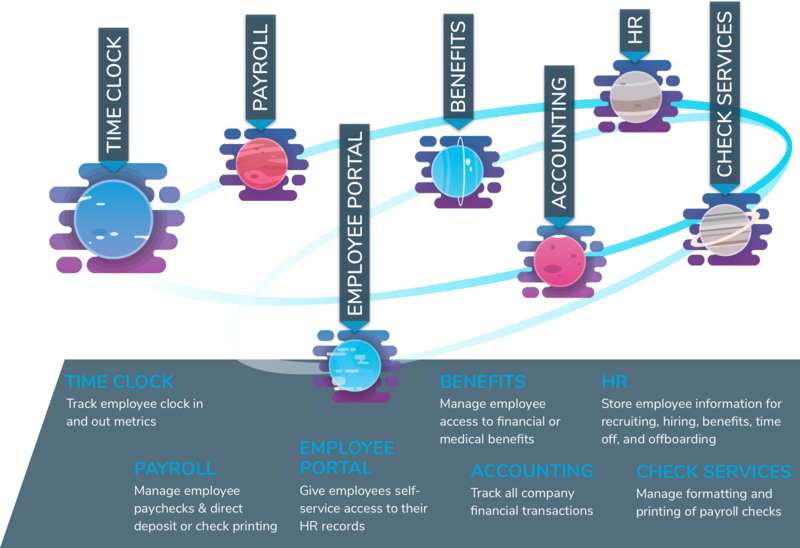 Enterprise-level payroll software is built for large or multinational corporations that require complex payroll calculations due to varied employee needs or tax structures. Oracle provides payroll software within their human capital management solutions, or through their PeopleSoft offering. ADP offers payroll solutions for any sized business, with an enterprise specialization for global businesses managing payroll across different geographic locations. Ramco lets large businesses customize their payroll rules to ensure global compliance. Kronos Workforce Ready software updates quarterly to stay compliant with ever-changing state, local, or federal taxes. 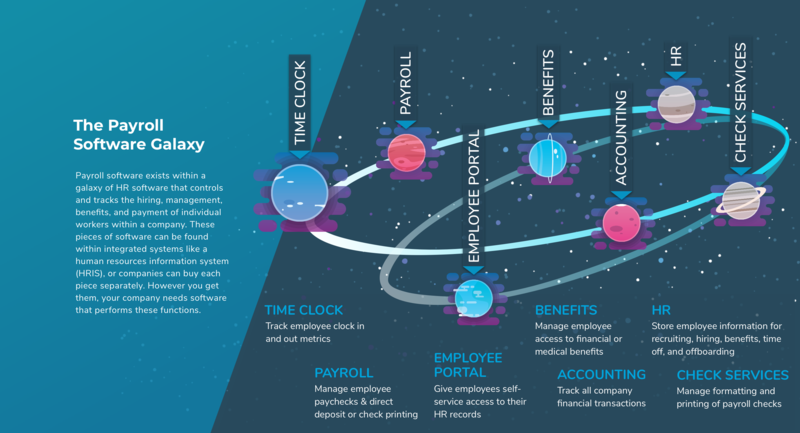 Mid-market payroll software is designed for companies with over 100 employees or several locations, but without the complexities that multinational corporations might need. Zenefits total HR system makes payroll easy for companies by automatically pushing benefits, payroll, or deductions to the payroll module. Sage Payroll Services software automates payroll processes like pay statements and tax filings. UltiPro promises fast payroll with the ability to process up to 200,000 checks an hour while maintaining accuracy. Ceridian Dayforce software is a complete human capital management system that combines payroll with HR, benefits, workforce management and talent management. Small business payroll software is designed to give companies easy to use payroll software without the prohibitive expense of a more feature-rich payroll system. Intuit Quickbooks payroll provides easy to use payroll features within one of the most widely-used small business financial systems available. Gusto provides full-service payroll along with critical HR features that small businesses need. Wagepoint software makes setting up payroll easy for small businesses, and even includes an auto-approve feature to reduce the need for weekly approvals. Patriot Software’s online payroll software gives company free support and setup, and employees can access their checks through the free employee portal.